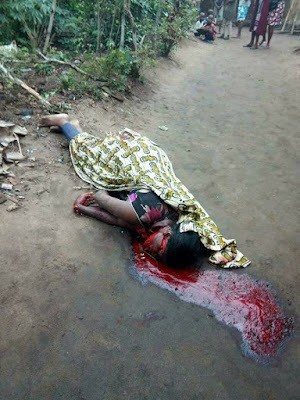 Tragedy struck Monday morning in Mbiabam Ibiono Community, in Akwa Ibom State, when a Vulcanizer identified as Nkere-Uta, allegedly slaughtered his wife, Bella with a machete. The incident, according to our source, occurred at about 8 am in a community which is about 15 minutes drive to Uyo, the State capital. However, it could not be immediately ascertained why the man allegedly murdered his wife, who was in her early 30's with five children. THE Town Crier Newspapers reporter scooped that the poor woman who lost her life to domestic violence was a hard-working petty trader and well loved by all that knew her. ‎Contacted, the Police Public Relations Officer, Akwa Ibom State, Odiko McDon, confirmed the incident. He said the suspect has been arrested by Itam Division of the Nigeria Police Force. When asked the motive behind the murder, Odiko replied via WhatsApp: "Investigation is in progress... U will be communicated Pls.